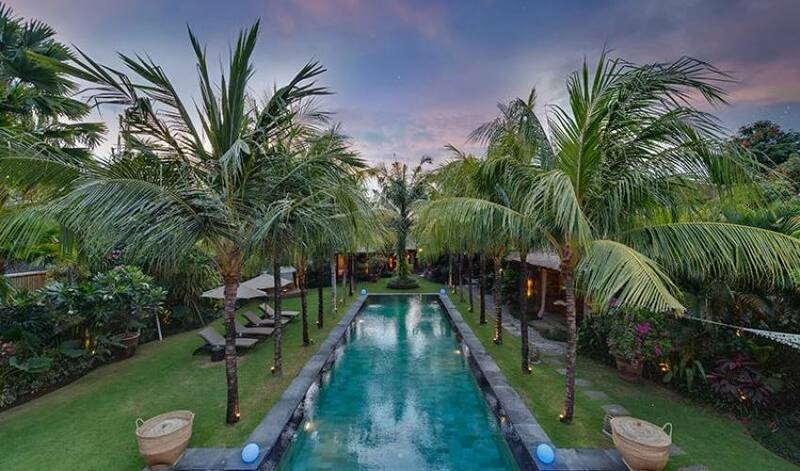 This Luxury Seminyak Villa is a hidden oasis – sophisticated, secluded and exclusive – yet only minutes from the boutiques, restaurants and nightlife of fashionable Seminyak. 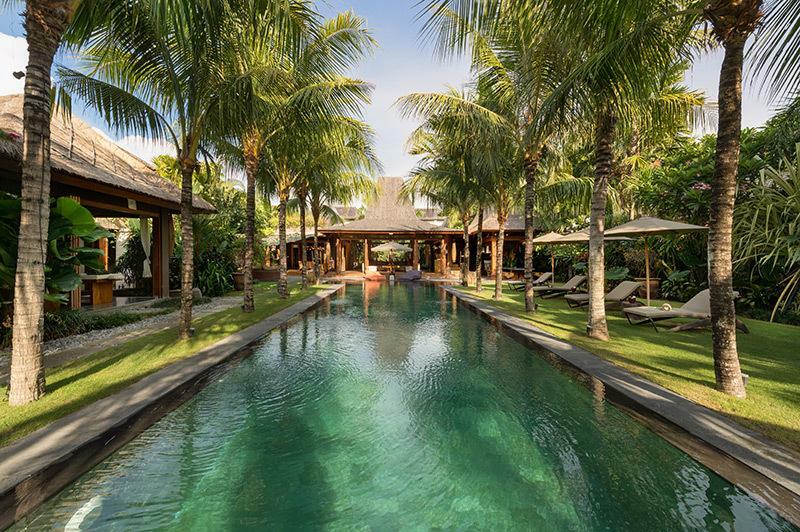 With five elegant ensuite bedrooms and numerous lounge areas, this fully staffed villa blends the charm of traditional Indonesian architecture with the luxury and comfort of modern conveniences. Thoughtful use of space makes the villa the perfect choice for large groups or families sharing. 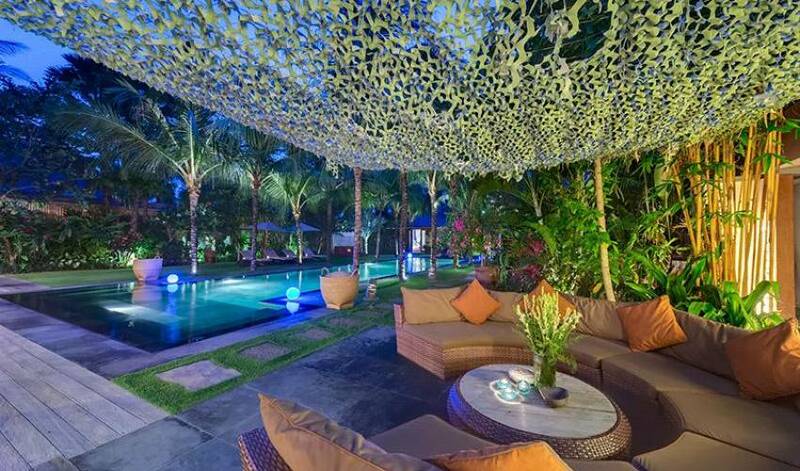 You won’t believe you are in the heart of bustling Seminyak when you step through the gates into the exquisite walled garden of the villa. Your holiday has begun. You will have a perfect night’s sleep in the elegant master suite, peaceful garden room or one of the charming ensuite bedrooms in the guest pavilion. 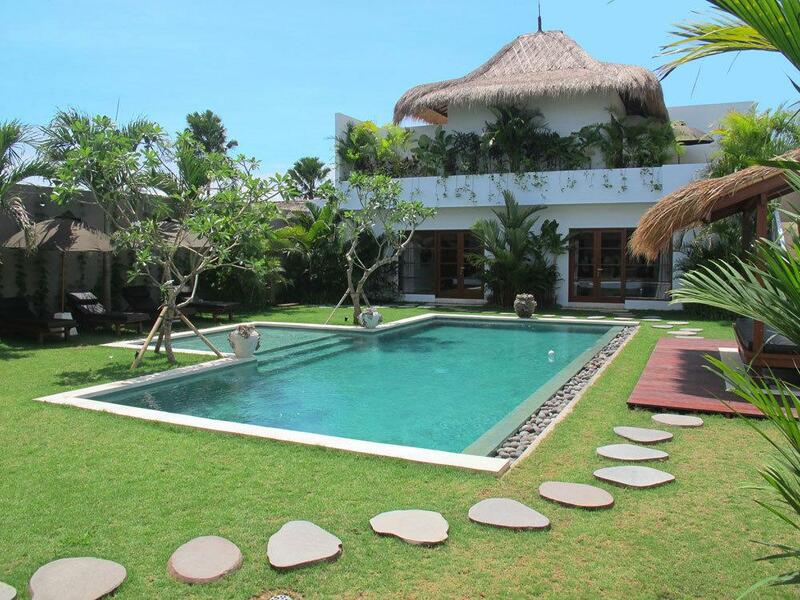 For a central-Seminyak property, this villa is exceptionally spacious, amazingly peaceful and totally charming. 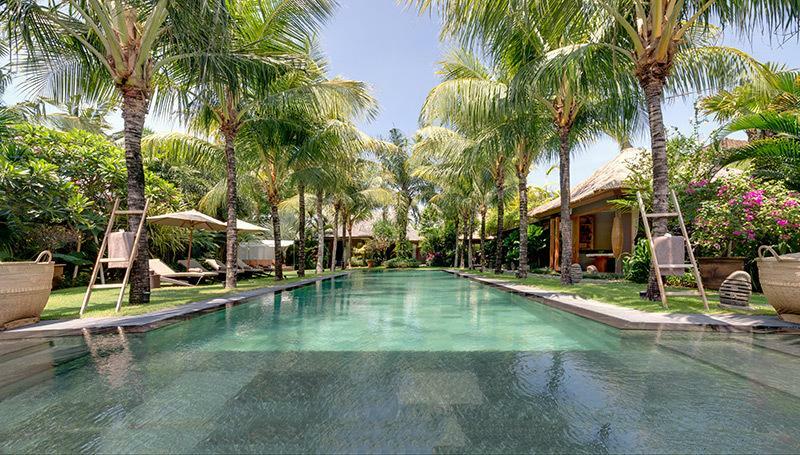 Set within a private walled garden, the villa effortlessly fuses old and new, borrowing its eclectic style from the intricately carved traditional wooden joglo houses of Java, and blending it with today’s requisite comforts. This single-storey villa comprises a main pavilion and a three-bedroomed guesthouse, set at opposite ends of a luxurious 19-metre swimming pool. 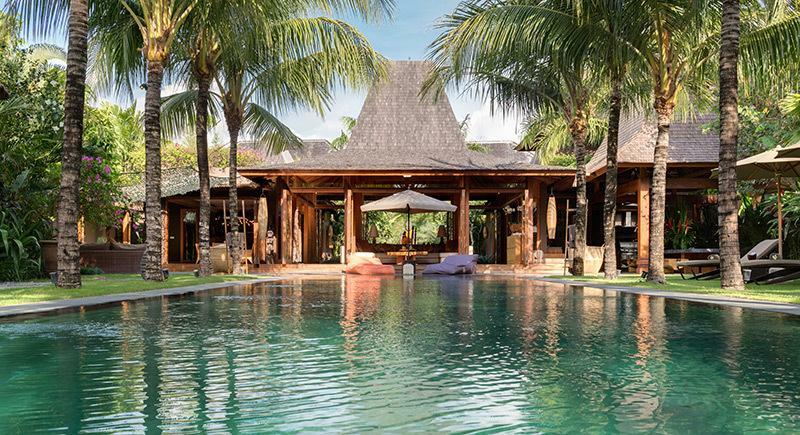 The open-plan design of the main building allows natural light to flood into the space and accentuates the honey-coloured detail of the recycled teakwood that is the signature feature of this villa. An ornate chandelier hangs from the soaring rafters of the century-old roof in the comfortable and stylishly furnished living room, which is adjoined by an elegant dining area where a table for ten makes the perfect setting for a dinner party. To the rear of the dining space is a chic, custom-designed kitchen incorporating an island workstation and breakfast bar. The villa’s master suite features an exquisitely carved joglo canopy above the bed and a huge ensuite garden bathroom. 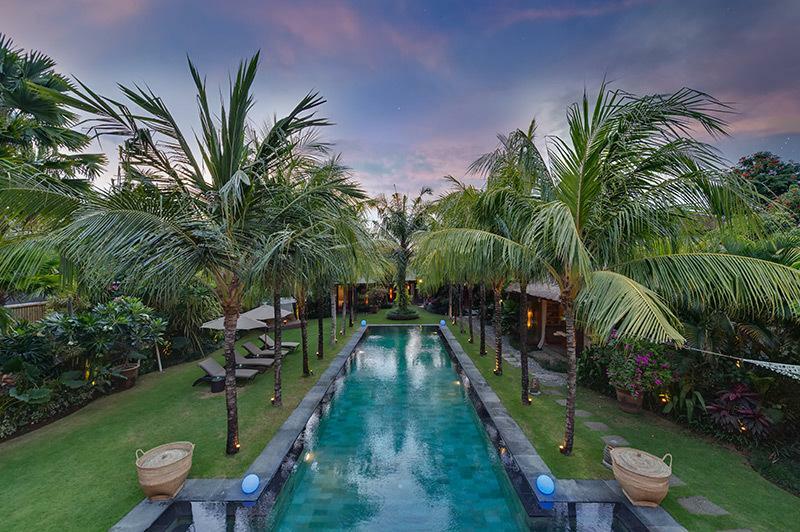 The master and second bedroom sit beyond the living areas, to the rear of the villa, and both overlook a peaceful water feature complete with large stone Buddha and tranquil lily pond. The three guesthouse bedrooms, all ensuite, are arranged around a second TV room, brightly decorated and perfect for children. The villa features a fully equipped media room complete with large screen projector, surround sound system, DVD and satellite TV with an extensive library of DVDs, CDs and books for guests’ enjoyment. WiFi is also available throughout the villa. Leading away from the main building, past circular outdoor lounge seating under a shady ‘sail’ canopy, is a double spa room where guests can enjoy massage and Ayurvedic treatments administered by skilled therapists. Guests at the villa are served by a wonderful team of staff including a house manager, private chef, housekeepers, butler, gardeners and security guards, all dedicated to ensuring that you have the perfect holiday. 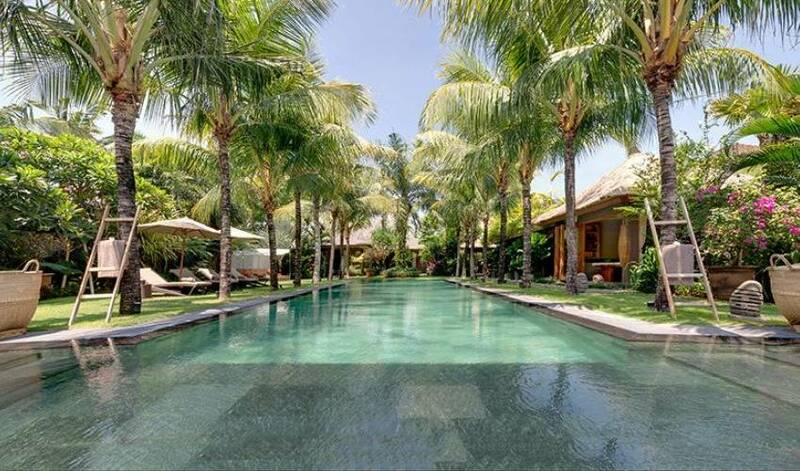 The villa’s three single-storey pavilions all face the 19-metre pool, which is bordered by two orderly columns of palm trees and an immaculately manicured lawn. 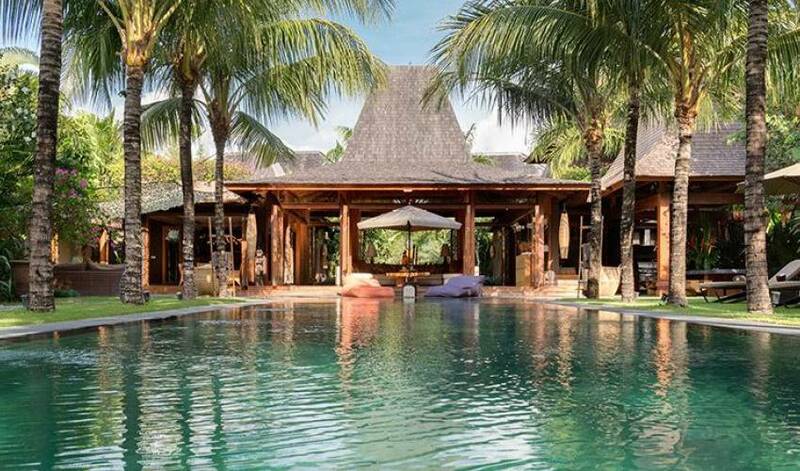 The villa’s main living pavilion lies at the far end and houses the master suite and one of the guest bedrooms as well as the elegant living and dining areas, TV lounge and superb modern fitted kitchen. 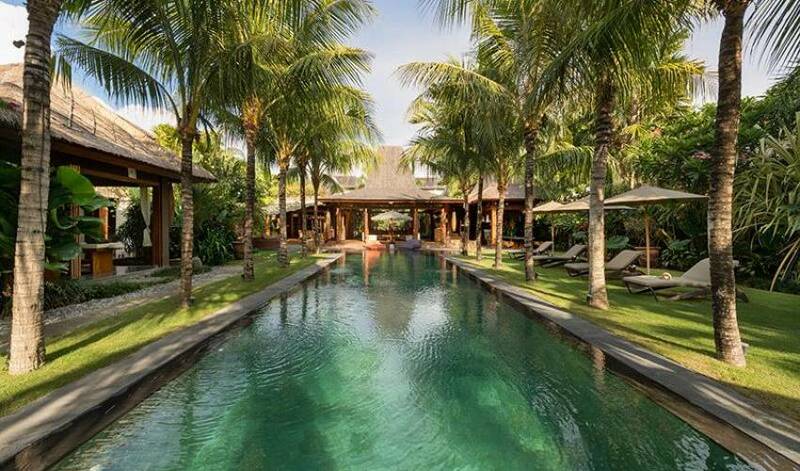 The guest pavilion is situated in complete privacy at the opposite end of the pool and comprises three ensuite bedrooms and a second TV room. 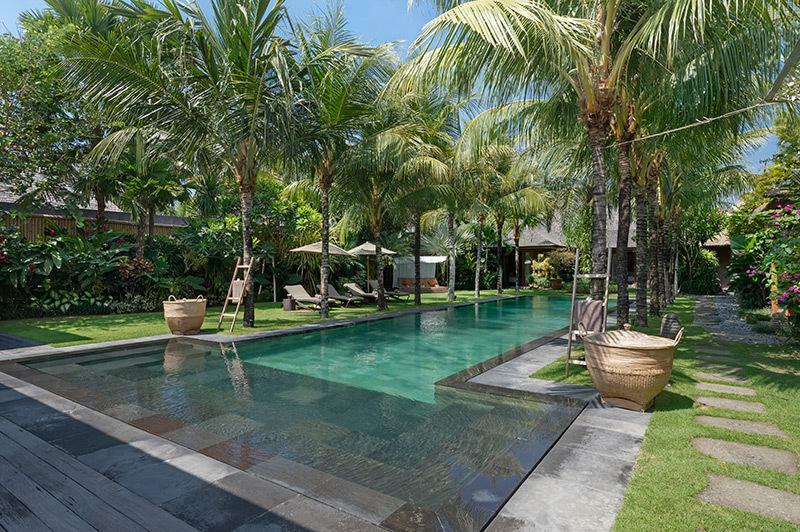 At the side of the pool is a private air-conditioned spa room with two massage beds, while comfortable outdoor seating and sun loungers are thoughtfully arranged poolside and throughout the gardens. The imposing antique Javanese joglo that forms the heart of the villa’s comfortable living room evokes an authentic sense of place. Below the soaring roof is a huge U-shaped couch set around a coffee table, while an ornate crystal chandelier adds an elegant decorative element and a small army of wooden statues stand in attendance. Glass folding doors open widely to admit a cooling breeze and the peaceful sound of trickling water emanates throughout the pavilion. The dining room adjoining the living area is furnished with a solid wood table and ten chairs crafted in woven bamboo. To the rear of the dining area is a large, modern, well-equipped kitchen, designed to be as pleasing to holiday cooks as it is to guests who would prefer to take a back seat at the breakfast bar and watch the villa’s private chef do the work. 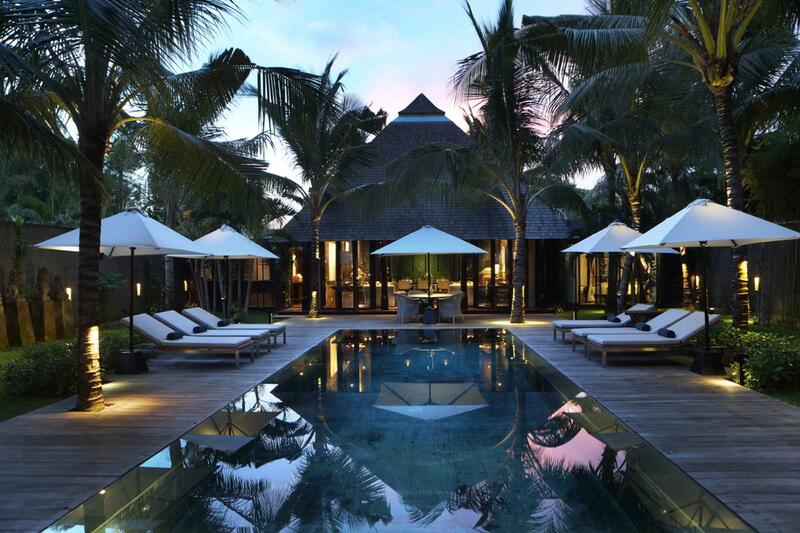 Flanking the 19-metre swimming pool is a wide, manicured lawn lined with tropical palms and fragrant frangipanis, and furnished with sun loungers and a shady balé for the ultimate in relaxation. Opposite the pool is the villa’s air-conditioned spa therapy room with two massage beds for in-house treatments, which can be easily arranged by the villa manager. On a shade-dappled deck to one side of the living pavilion is a large circular seating area – perfect for evening cocktails or a relaxing afternoon read. On the other side is a beautifully designed open-sided dining area complete with massive twenty-seat table and barbecue. The villa’s four air-conditioned guest bedrooms are all luxuriously appointed with queen-size beds, courtyard bathrooms, plush interiors and natural finishings of wood, stone and glass. The first guest bedroom is situated in the main pavilion, across the lily pond from the master suite. This lovely room is furnished with a four-poster bed and plush cushions and linens. The large outdoor ensuite features a double slate-coloured stone bathtub, twin washbasins with ‘Hollywood lighting’ lining the mirror and a tropical rain shower. The three comfortable guest pavilion bedrooms all face onto a central TV room and are ideal for children or extended family groups as the beds can also be configured as twins. 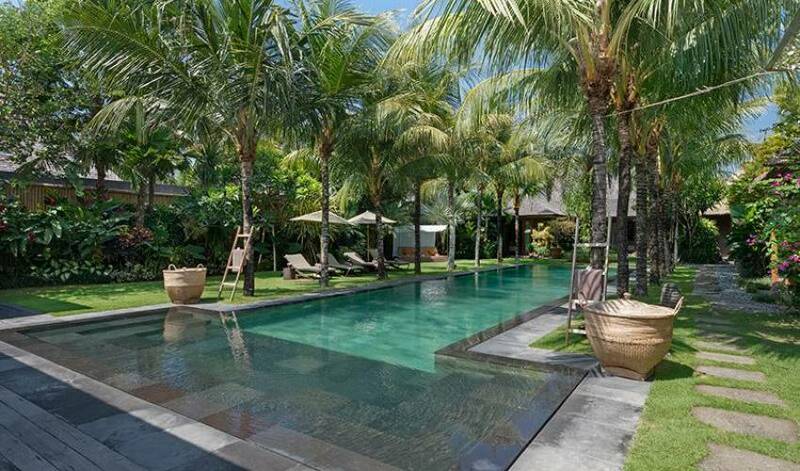 The villa enjoys one of the most sought-after locations in Bali, offering guests a complete hidden paradise in Seminyak’s ‘Golden Triangle’. 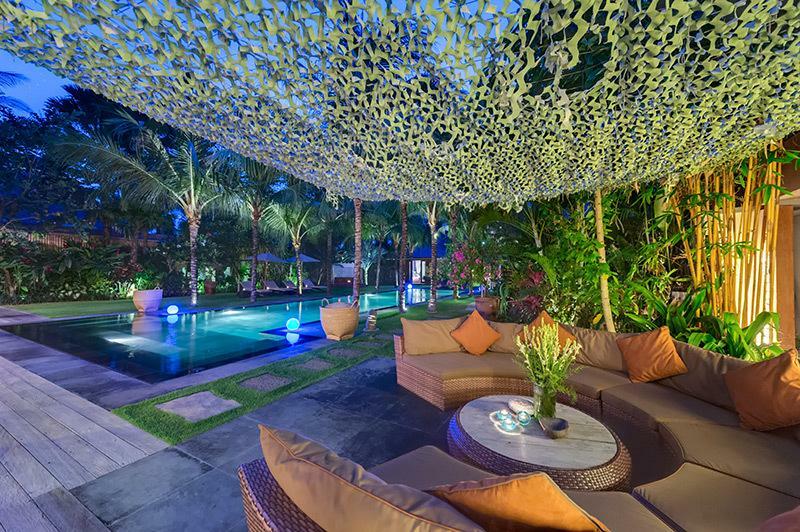 Guests are just minutes from Seminyak’s main street, Jalan Kayu Aya (also called Jalan Laksmana, Oberoi or ‘Eat Street’), where an impressive array of dining and entertainment options abound. 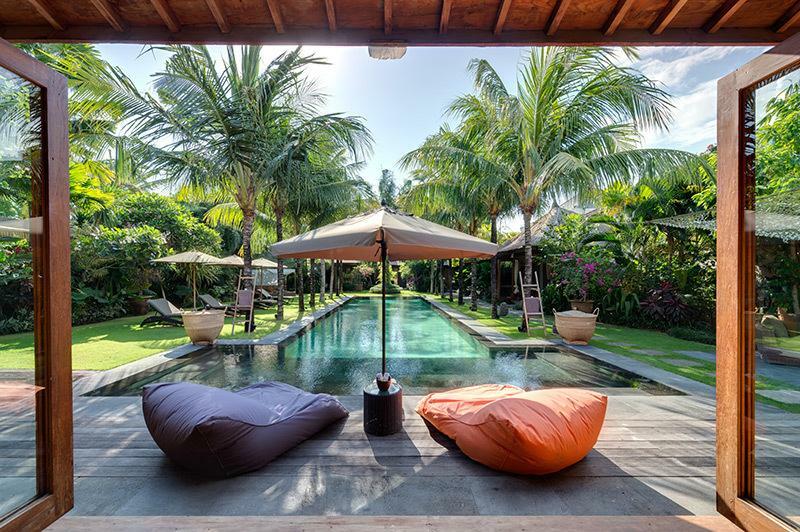 Trendy boutiques, supermarkets and ATMs are all within a short walk of the villa, as are some of the island’s best known entertainment and dining venues, such as Ku De Ta, W Hotel, La Lucciola, Potatohead beach club and other glamorous Seminyak staples. 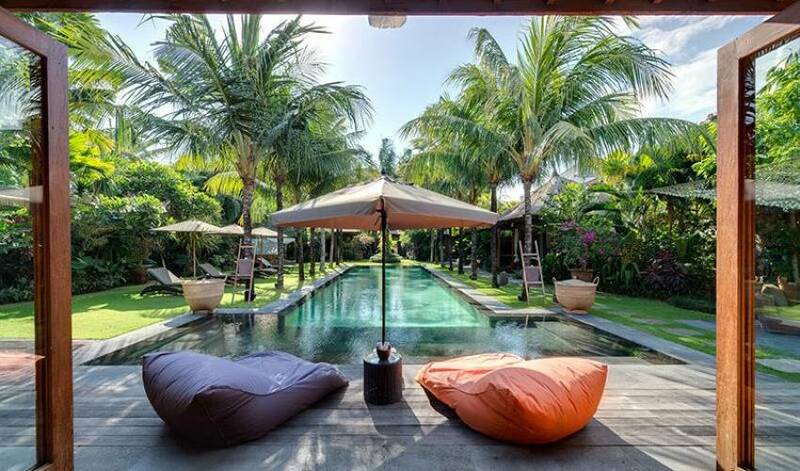 Villa is also just 500 metres from the beach, where guests can enjoy a variety of water sports, long seaside walks and beautiful Bali sunsets.